Although I must say, what I love the most is her way of making friends. 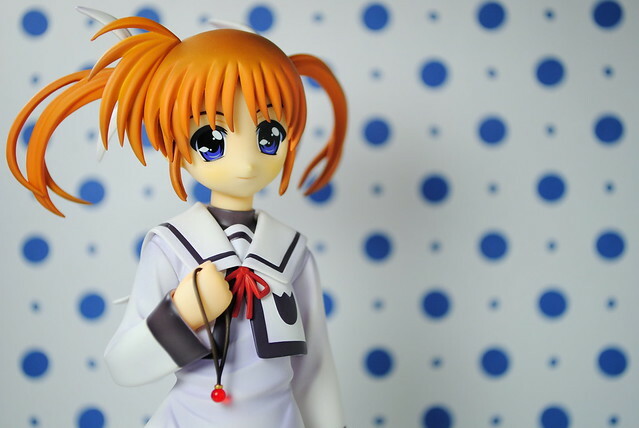 Today I will share a short and simple photo shoot of Alter's lovely Nanoha in her school uniform. I'm still trying to get back into the hang of doing scaled shoots so this might be a little off here and there. 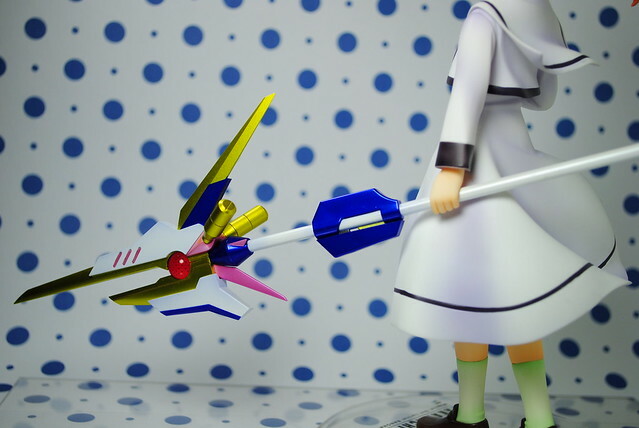 I like this figure, much like the other two Alter Nanoha figures I own. 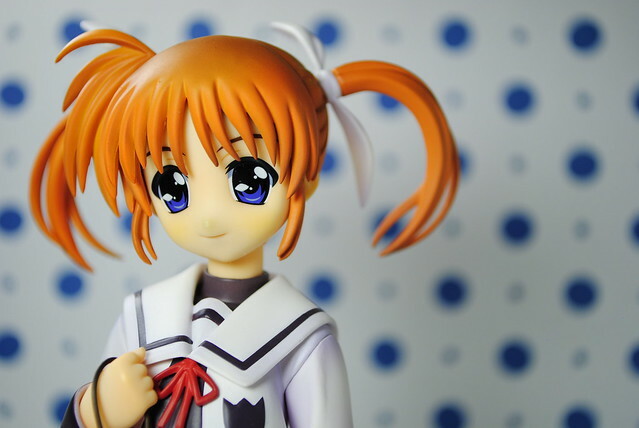 Nanoha's face is so cute, I love nice simple smiles like that. As always Alter does not disappoint with their attention to detail as with Raising Heart in pendant form or with the detailing in Nanoha's uniform with the folds and shading. 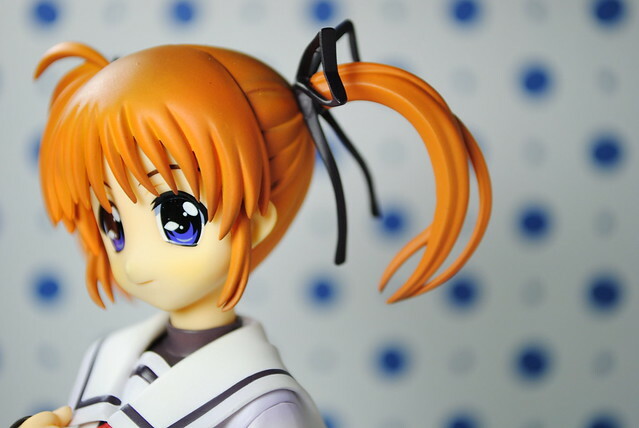 Nanoha comes with a couple of ribbons, her regular white ones and these black ribbons. From that memorable exchange at the end of the first season or the movie where Nanoha and Fate confessed their feelings for each other expressed their friendship. 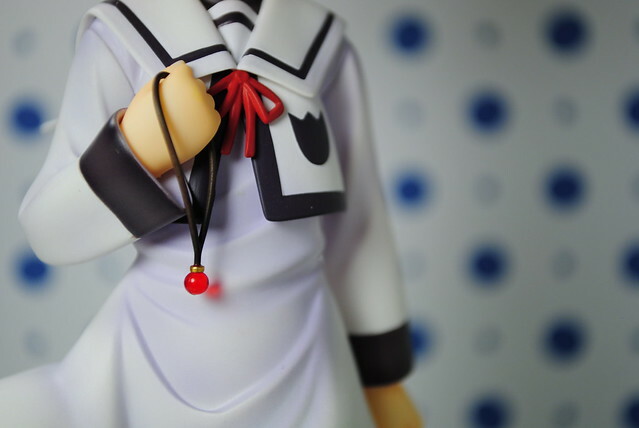 I like the black ribbons more, I think they go well with the color scheme of her uniform. ... and Yuno, but who cares about him anyways. Interesting thing about it though, it's the same as the one that came with Nanoha Standby Ready with both the figures being 1/7th scaled. 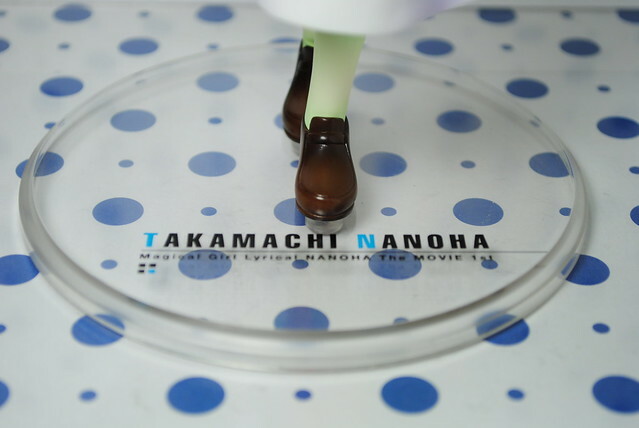 This uniform version Nanoha is bigger though, so much for scale accuracy. 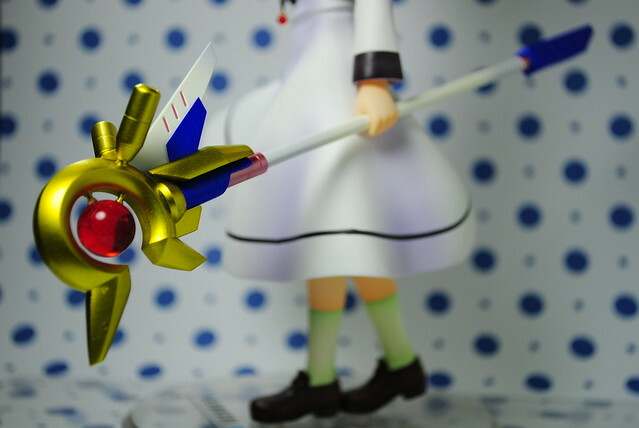 Since Raising Heart is the same size so you can totally display this Nanoha with the cannon mode version if you own Stanby Ready Nanoha as well. 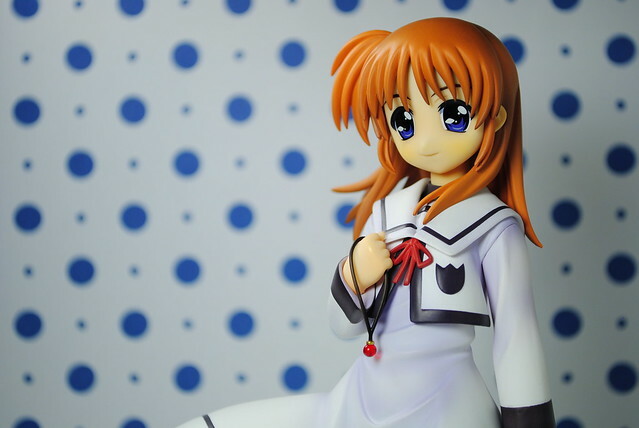 What attracted me the most to this figure is this, Nanoha with her hair down. Such a thing is quite rare in the shows, mangas and movie, so this makes it quite appealing to me. The base is a typical circle with Alter's usual name and such as they have done with the StrikerS figures in the past. 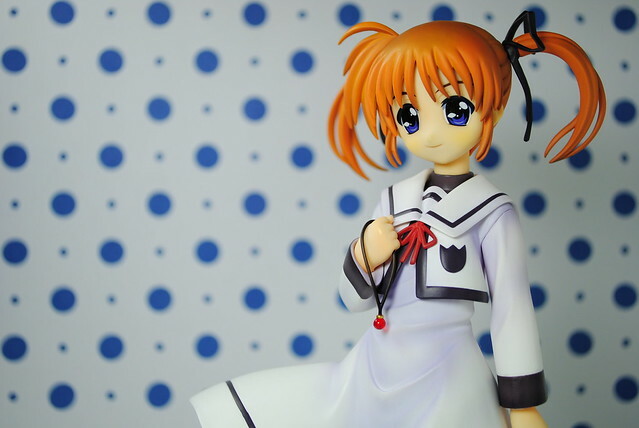 I'm quite happy with this figure, one more lovely Nanoha figure to add to my growing collection dedicated to her. 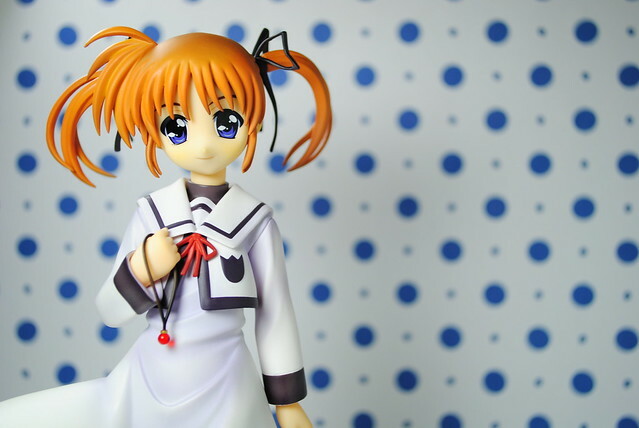 With this I now own, 2 figmas, 4 scaled figures and a dollfie of Nanoha, I obviously like the character a lot.